Mr. Tim was diagnosed with hypertension 5 years ago. It was a sad news for him because he had to readjust almost every part of life to keep his blood pressure under control according to his doctor. This meant paying attention to what he ate and drank; it also meant he had to stop taking alcohol and smoking–the two things he used to cool off the stress of work. In addition, he was to swallow at least three pills (anti-hypertensive medications) every day for the rest of his life. For 5 years, he maintained his doctor’s instructions. His very loving wife played a crucial role in helping him adjust to this new life. Both in their late 50s, Mr. Tim’s wife made sure he ate the right food; she reminded him to take his antihypertensive medications if he was about to forget; she accompanied him to the hospital whenever he had an appointment with the doctor. Mr. Tim lost his wife in a car accident while she travelled to their family home in the village. This broke him. For weeks after his wife’s burial, Mr. Tim did not bother to take his antihypertensive medications; he went back to drinking alcohol and smoking. One morning while he was about standing up from his bed, Mr. Tim had this sudden, severe headache and then collapsed and passed out. It was the house cleaner who found him lying on the floor and rushed him to the hospital. After the doctors at the emergency department rushed to administer emergency treatment, Mr. Tim woke up but could not speak; the left side of his face, including that side of his mouth, was weak; his left arm and leg were so weak that he could not move them on the bed he was lying on. What Mr. Tim had was a stroke. 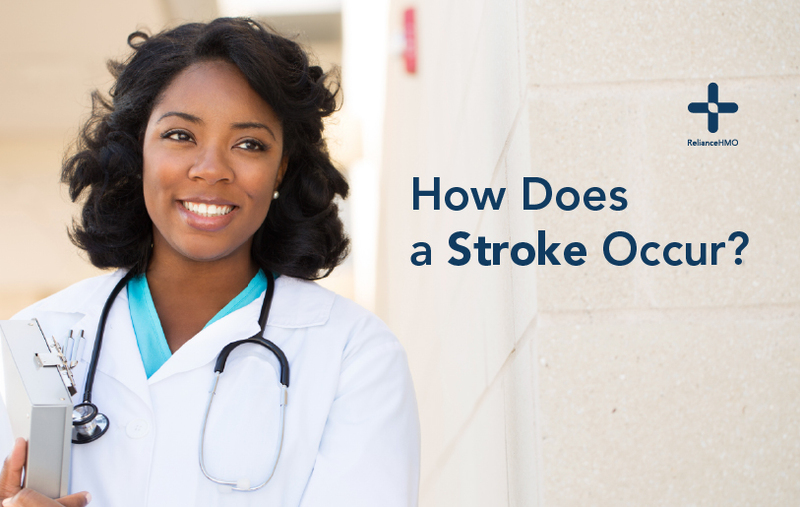 Stroke is basically what happens to specific parts of the body when the blood supply to a part of the brain is significantly reduced or totally cut off and this lasting more than 24 hours. The brain cells depend on oxygen and nutrients in blood to survive; once this supply is tampered with, the brain cells in the part affected starts dying within minutes and so do the body functions controlled by that part of the brain. The first type, called ischaemic stroke, is the commonest and results when blood clots or fatty deposits (in people with high blood cholesterol) formed in an artery supplying the brain blocks the artery, cutting off blood to that part of the brain; the blood clots or fatty deposits can also be formed in an artery outside the brain such as that of the heart and carried through the blood to become deposited in an artery supplying the brain. The second type of stroke is called haemorrhagic stroke and occurs when a blood vessel supplying a part of the brain ruptures and blood leaks into the brain tissue. Haemorrhagic stroke usually manifests suddenly. The person may experience a sudden, severe headache which may be associated with vomiting and usually, he or she loses consciousness thereafter; when consciousness is regained, there is weakness or numbness of a certain part of the body or difficulty with speaking and so on. In addition, the risk of having a stroke increases if one has a family history of stroke or a heart attack, is a man, is African or is at least 55 years of age or older. Stroke can lead to lifelong disabilities such as paralysis of certain parts of the body (the person may need support to walk or do some other things for life), speech or memory problems. Hence, time is of great importance when getting people who just had a stroke to the emergency department of any hospital for emergency treatment. Lifestyle modification involving healthy meals, reduced salt intake, physical exercise targeted at losing weight for overweight or obese people, stopping cigarette smoking and significantly cutting down alcohol intake. Regular checking of blood pressure and blood sugar. People with hypertension or diabetes should adhere strictly to their medications (they shouldn’t skip or stop their medications for any reason). Going for regular medical check-ups as people approach their late 40’s and 50’s. The same applies for people with a family history of hypertension, diabetes, stroke or a heart attack.